I love this paper I love this paper I love this paper. 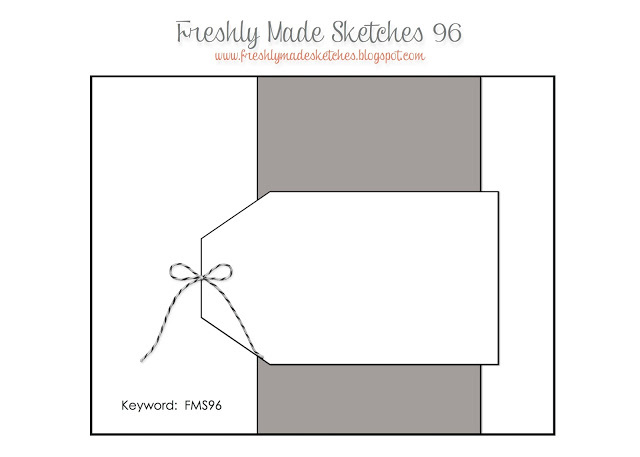 When I saw Amy O’Neill’s new sketch over at Freshly Made Sketches, I knew I 1) wanted to use my new Chalk Talk framelits and 2) wanted to use the Quatrefancy Specialty designer series paper. There are so many great new paper packs in the annual catalog, but this one has to be my favorite. I looooove bright colors and have to force myself to use subtles and neutrals, so this paper is perfect for me. I used Island Indigo cardstock to frame the strip of Quatrefancy under the tag. I wanted to do lines of paper piercing on either side of the DSP, but I couldn’t find my little piercing mat, so I decided that plain was much prettier anyway. I used the biggest Chalk Talk framelit as the base for my tag, then layered the DSP tag (another Chalk Talk framelit) on top using Dimensionals. Seriously, I have to rein myself in from putting Dimensionals between every single layer on every single card. I just love dimension. The sentiment is from the Hello, Lovely stamp set, and I just cut a rectangle of Whisper White to frame the sentiment so it doesn’t blend in too much with the paper. The Island Indigo Chevron ribbon looks so good with this paper, and really I just wanted to hold it and work with it. It’s not just pretty – this ribbon feels good, kind of like really comfy sheets. I like to rub it between my fingers, and now you’re backing away slowly from the creepy ribbon lady. I finished the card off with a couple of rhinestones. And voila. Monday I will be rolling out details of my new Stamp of the Month Club, so stay tuned for those! I love being an independent Stampin’ Up! demonstrator. If you think you’d love it, too, now is a great time to join and be a part of my team! The cost to join is $99 + tax (no shipping), and you get $125 in product (you choose your kit yourself). If you join between now and August 31, in addition to your $125 in product, you will receive one of four great project kits. 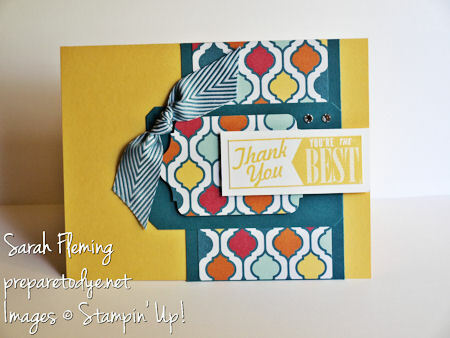 Click the link to my Stampin’ Up! site to join (or to see a list of demonstrator benefits), and feel free to email me with questions.